Size male: 35 - 40 mm. Size female: 45 - 55 mm. 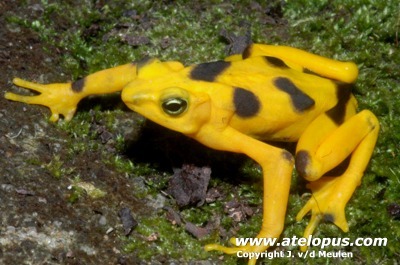 Atelopus zeteki - male. Population near Ell Valle. 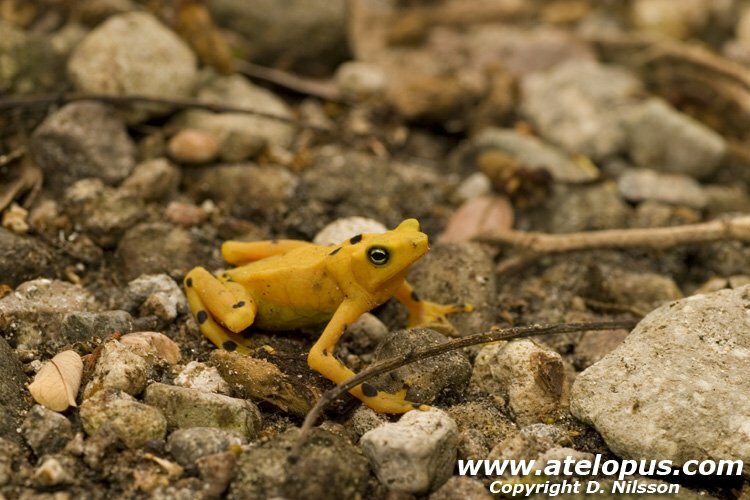 Atelopus zeteki - male. Population near El Valle. 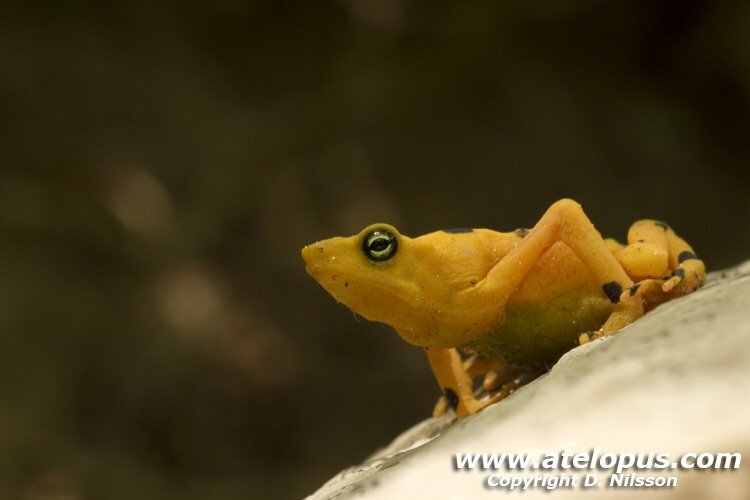 Atelopus zeteki - male. Population near El Valle. 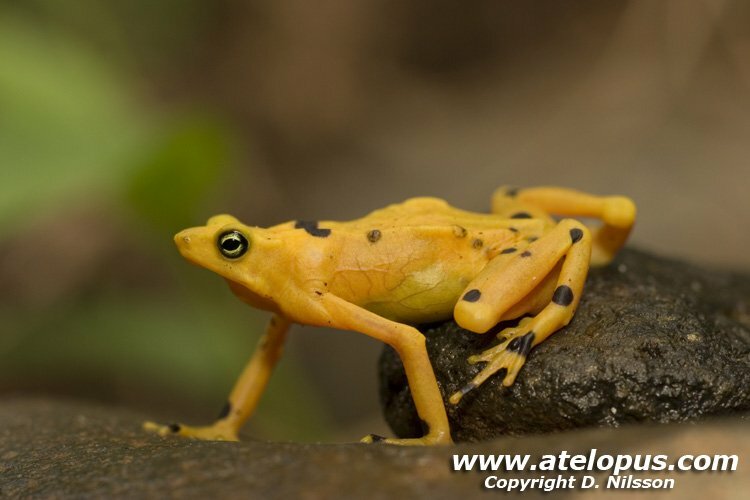 Atelopus zeteki - female. Population near El Valle. This species inhabits streams along the montane slopes of the Central Cordilleran rainforests and cloudforests of western-central Panama. They are found in two habitat types, wet forest streams and dry forest streams. 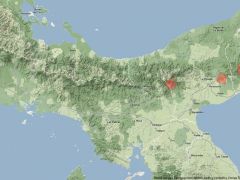 Altitude: 335-1315 meter above sea level. 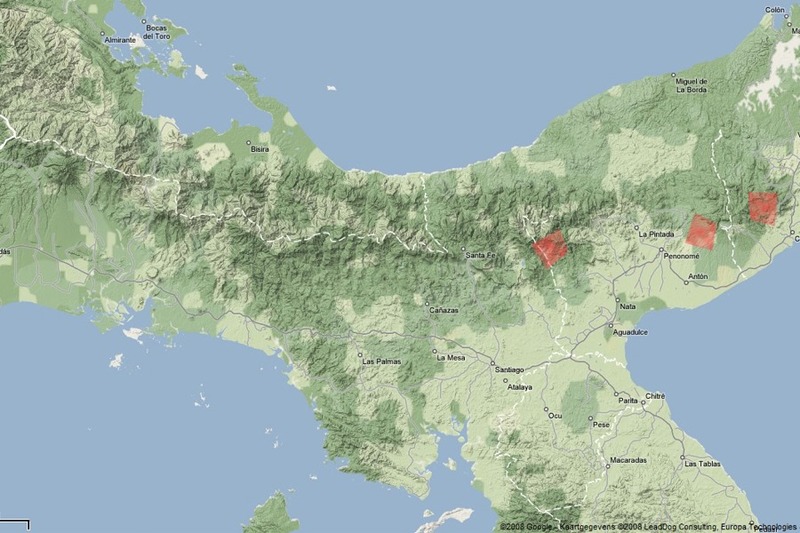 The original distribution of A. zeteki was at three main localities. Around El Valle de Antón, Cerro Campaña and in the area near El Cope in a 'band' along the montane slopes. This species is declared extinct in nature at all known localities since 2007. Scientists have collected the last few remaining animals from the wild to save them from extinction and to try to breed them in captivity. Look at the video where Eric Lindquist is showing the BBC filmcrew the last animals and their amazing behavours. A few animals where found during march 2008 (D. Nilsson) and by a film crew from Animal Planet just a few weeks after, but more people have been at the same location since without finding any animals just weeks after Animal Planet had left (eg. M. Bartelds). Chytridiomyscosis is the main reason why this species is now gone. This is a terrestrial species living in two main habitats. 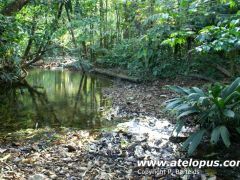 Along small dry forest streams and along wet forest streams. 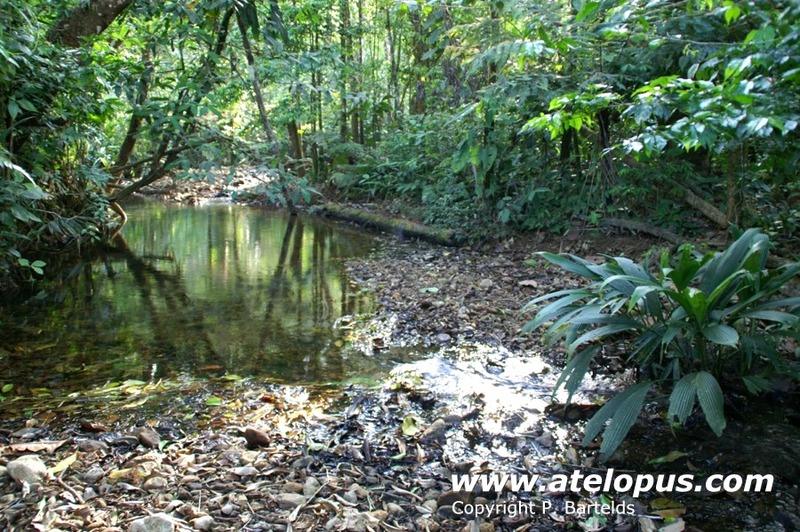 The animals in wet forest are larger with males measuring 39-40mm and females measuring 55-63mm. The dry forest population tends to have smaller individuals with males measuring 35-40mm and females measuring 45-55mm. In wet stream habitats the animals are dispearsed along and in streams. They can climb and are sometimes found up to 3 meter above ground, perching on lage moss covered boulders near waterfalls and along the banks of streams. Along the dry forest streams the frogs are smaller (about 2/3 the size) and mainly distributed over the forest floor and are usually found only up to 1,5 meter above the ground. 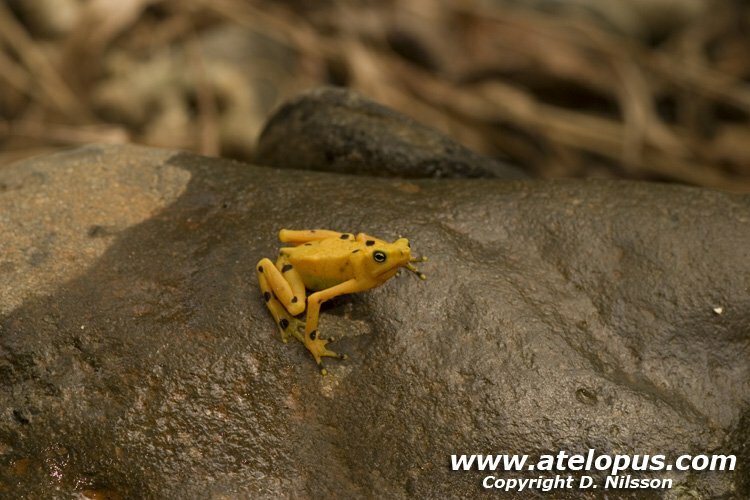 The population density of Panamanian Golden Frogs used to be a lot higher in dry forests than in wet forests. Females move into the forests in the late dry and early rain season around February-March and return to streams to breed in the late rainy and early dry season around November-January. Males tend to stay along streams during the year, etablishing territories and waiting for the females to return. Male frogs perch on rocks in or along the banks of streams and waterfalls and they defend their territory by semaphoring with "hands". Males also vocalize but prefer semaphoring. Apparently due to the noise from waterfalls and stream flows. 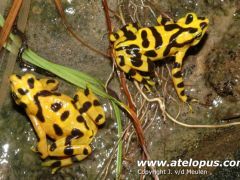 Females also semaphores in this species, as they do in the related species Atelopus varius. Males are the most common gender resulting in the majority of males being single. The females found in streams are often found amplexed. Habitat for A. zeteki near El Valle. 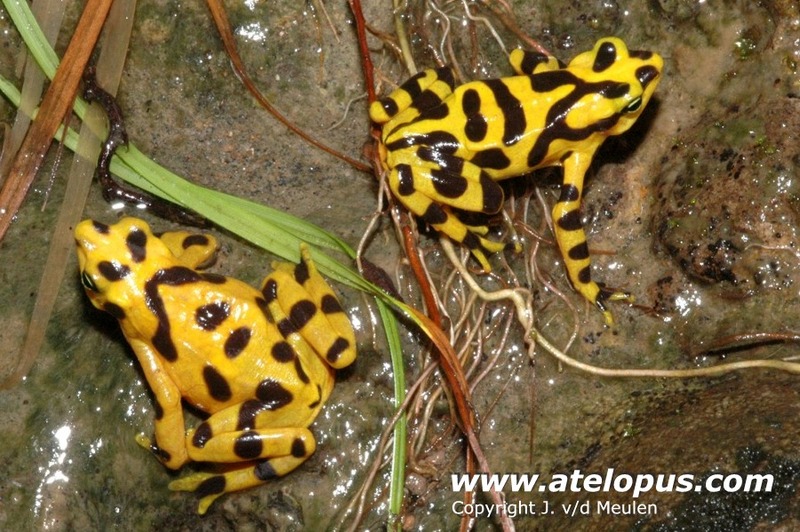 Atelopus zeteki is the most toxic species of Atelopus. The toxins are split into Zetekitoxin AB and Zetekitoxin C. This is currently the only known amphibian with saxitoxin-analog activity. The hypothesis is that the colorchange in juveniles goes paralell with the animals obtaining their skin toxicity. The structure of zetekitoxin AB has remained a mystery for over 30 years until 2004. (Yotsu-Yamashita et al.2004). 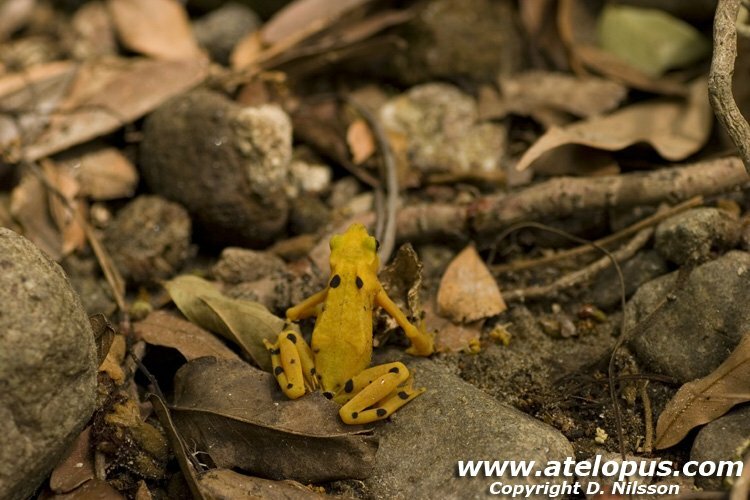 In 2007 a filmcrew went to the last known habitat to film the remaining Atelopus animals. 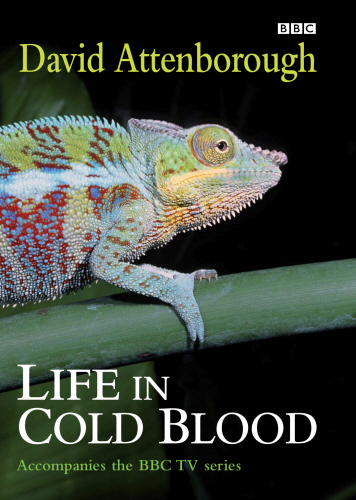 This footage can be seen in the documantary 'Life in Cold Blood' narrated by Sir David Attenburough. 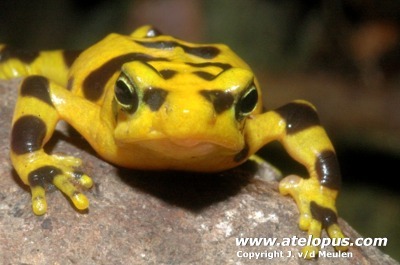 There are several breeding programs going on for Atelopus zeteki. One of the breeding projects are run at the Smithsonian's National Zoo in United States. 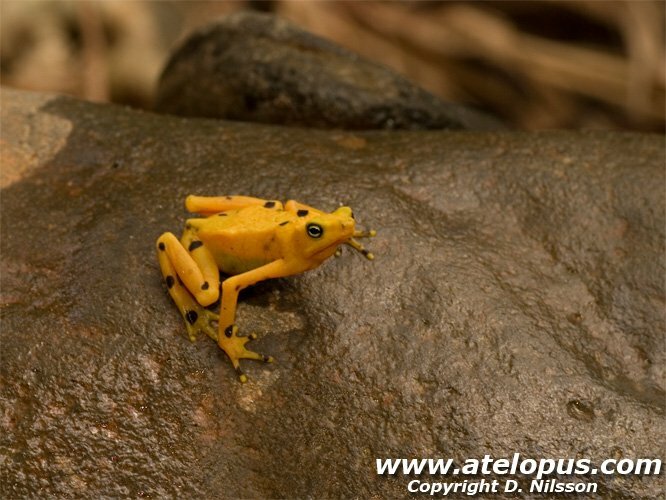 Video Description: Atelopus zeteki at The Smitsonian's National Zoo, US. 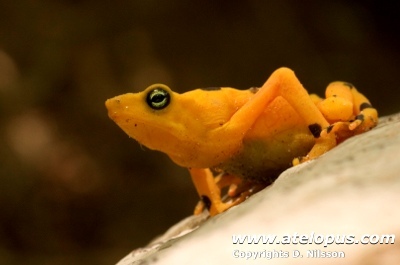 Vicky Poole, National Aquarium in Baltimore - Husbandry Manual Panamanian Golden Frog: Atelopus zeteki. PDF accessible. 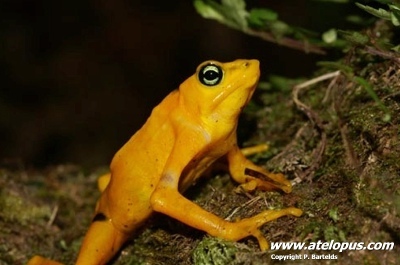 Carlos W. Ramos, Nilka Pimentel and Victor Martinez-Cortes - Karyotype of the Endemic Golden Frog Atelopus zeteki (Dunn) from Panama. PDF accessible. Photographs of A. zeteki - Panama All photos taken near El Valle de Antón.